Citing the need for more research, Montana Fish, Wildlife & Parks is unlikely to meet its goal of establishing new bighorn sheep herds by 2020. During a work session Thursday, FWP commissioners heard the latest research on challenges facing bighorn sheep and how some results make FWP managers want to hold off on taking action to expand Montana’s herds. “What is the path forward? We have to weigh the benefits vs. the risk. I will admit that FWP is being very conservative with our approach to sheep management because there is much at stake,” said FWP Big Game Chief John Vore. In 2010, FWP biologists knew that bighorn sheep populations were struggling because herds sporadically suffered die-offs due to pneumonia epidemics. One such die-off happened in the Bitterroot Valley. Depending on the size of the herd, it could be cut in half or wink out completely. Biologists knew domestic sheep carried pathogens that tended to be more dangerous to wild sheep and assumed that was the main danger. 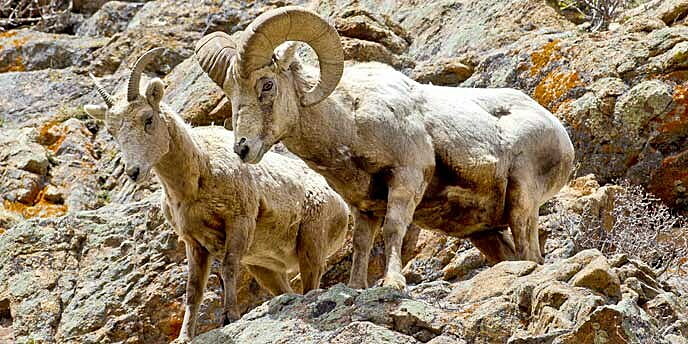 So when they wrote their 10-year plan, they recommended keeping wild sheep away from domestic sheep and created a goal of adding five more herds to the 43 in the state. But eight years later, no new herds exist, and a herd in the Tendoy Mountains has been eliminated. One herd was proposed in 2012 for the Bridger Mountains, but a few domestic sheep grazed property within 15 miles of where bighorns would be released so the proposal was dropped. Meanwhile, most herds have fewer than 100 animals, a situation that lends itself to inbreeding and an increased likelihood of the herd being wiped out by disease or predators. Still, FWP sets a cap of 125 animals for a herd because higher numbers have occasionally correlated with disease outbreaks. But Vore said his agency felt the risk of transplanting animals was too great, based upon the threats of disease. He said it is also difficult to find places to put the animals, since the locations need to be far away from other sheep, have good habitat and be accessible to hunters. Vore said those limitations eliminated just about every opportunity not only of establishing new herds but also transplanting animals to augment other herds. That’s because recent research by Montana State University professor Bob Garrott and others has found that after about a century of interaction between domestic and wild sheep, most wild sheep already carry a lot of pathogens. So they could be infecting each other. If they survive an infection, some sheep can become immune. But there are probably different strains of the “M. ovi” bacteria, and a transplanted sheep could cause problems by bringing a new strain into a herd. It’s similar to the different strains of flu that affect humans: having immunity to one flu bug doesn’t prevent you from getting sick from another. That’s why Vore doesn’t want to do any transplants unless biologists can determine that they have “clean” animals – that is, animals that don’t carry M. ovi. But that’s not practical, according to Garrott research. “I question whether there are any clean herds in the West,” Garrott said. Garrott told the commission that carrying pathogens isn’t necessarily a death sentence. The greater Yellowstone ecosystem has the strongest population in North America, because it’s a metapopulation – several herds that interact – of 4,000 to 6,000 animals that all carry various pathogens but don’t suffer alarming die-offs. “Biologists are very happy with the performance of those populations. This is actually good news. It tells us that bighorns sheep can live with these pathogens. They’re living with disease just like we live with disease. What we don’t know is what makes some populations able to live with pathogens and others don’t. That could take another 50 years of research,” Garrott said. Biologists and wildlife advocates are concerned that the populations are too small for genetic health and argue that maybe some animals are more susceptible to disease because they are becoming inbred. While Vore doesn’t want transplants to avoid disease, he said that bighorn sheep migrate to other herds on their own, so genetic flow exists even though little genetic research supports that. But if they migrate, it’s likely they also enable the flow of disease. Commissioner Dan Vermillion asked why FWP couldn’t go ahead and transplant sheep into the Bridger Mountains. “Seems like all the sheep have pathogens, so there isn’t any chance of them getting sicker,” Vermillion said. Vore said the risk was too great that transplanted sheep could wander across Interstate 90 and infect other herds in the Spanish Peaks. Biologist Jim Bailey said FWP cherry-picked the research they cited and didn’t dig into problems of small populations and inbreeding. With a population of 100, the number of breeding animals is about 10, and that’s not enough. “The whole issue of genetics has totally been ignored. We’re never going to figure this out without bringing that into the picture,” Bailey said. Commenters asked FWP to sit down with stakeholders and try to work out an option for new herds, even if it’s only for one location. “We need some prioritization. It’s not good enough to say, ‘How much risk are we going to accept?’ and leave that question on the table,” said National Wildlife Federation spokesman Tom France.